Photo credit: Jay Tamboli of Washington, D.C.
Olbermann’s now-deleted tweet read: “It be rare and beautiful so me should kill it. 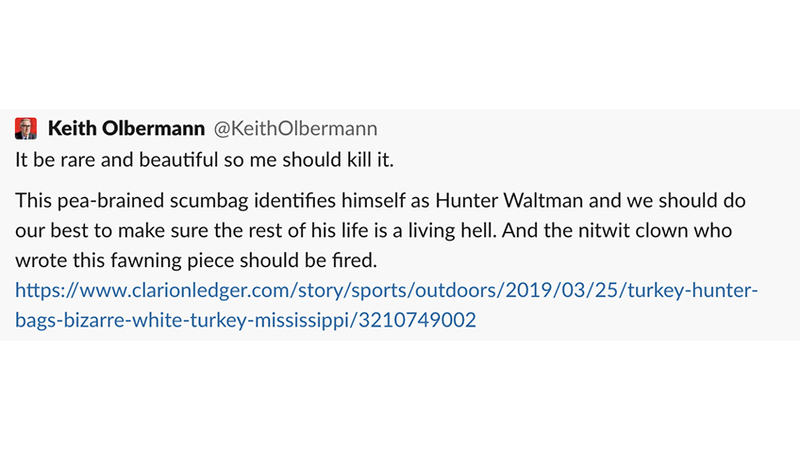 Olbermann added, “This pea-brained scumbag identifies himself as Hunter Waltman, and we should do our best to make sure the rest of his life is a living hell. 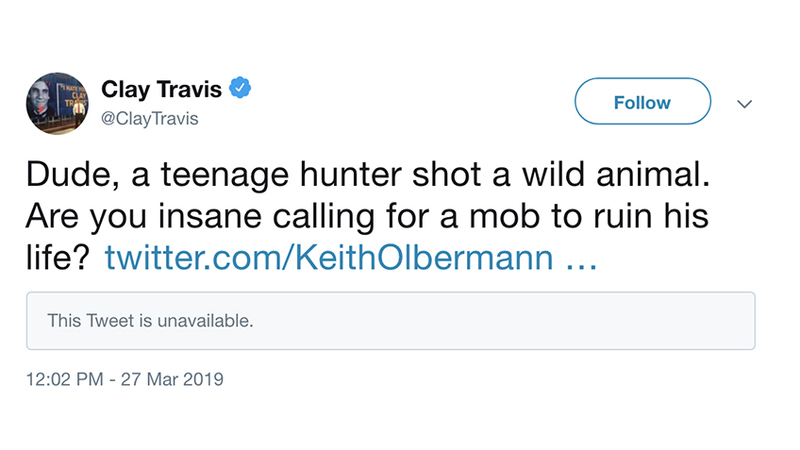 And the nitwit clown who wrote this fawning piece should be fired,” referring to the article on the teen’s hunt. The backlash online was immediate. Conservative commentators and wildlife conservationists across Twitter pounced on Olbermann for his ridiculous and hateful overreaction. 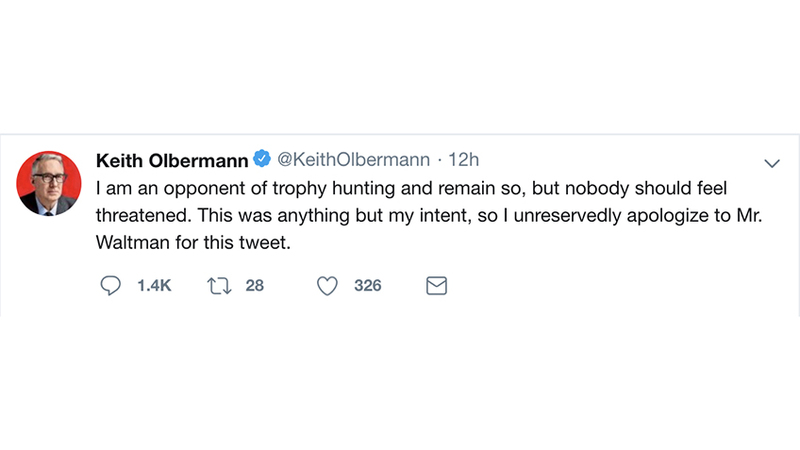 While Olbermann, in his so-called apology, tried to hide behind the attempted epithet of calling it a “trophy” hunt, anyone who has ever eaten a turkey dinner can attest to exactly what that young man is likely to be doing with his prize. We just hope he has the good sense to make all the trimmings of a Thanksgiving meal with it. Let’s examine the facts about turkey hunting and what it has done for wild turkey populations in the United States. Turkey hunting is considered one of the North American Model of Wildlife Conservation’s “Big Six” success stories—and for good reason. In fact, in the early 1900s with only about 30,000 birds left in the wild, most hunter-conservationists feared the wild turkey would go extinct. But through the efforts of hunter-backed and hunter-funded programs—trapping and relocation programs, habitat protection and improvement, and protective game laws—wild turkeys had recovered to a population of 1.3 million by the time the National Wild Turkey Federation was established in 1973. Today there are more than 7 million wild turkeys nationwide … all thanks to hunters. So the next time some anti-hunting extremist media personality calls for violence against a conservationist, remember that when sportsmen stand together and show the facts, we win. About the Author: Cody McLaughlin is a noted conservationist and conservative thought leader on public policy issues including hunting, fishing, gun rights, free-market tax and wage policy and the environment. He works as a GOP consultant for conservative political causes, managing clients’ digital communications and online presence and as a trustee of the New Jersey Outdoor Alliance, helping to represent the state’s 1.2 million sportsmen in the political arena.